Type: Eagle feather wedding ring, comfort fit ring shanks of 0.157 in (4 mm) wide. Feathers of Mishoomis Migizi, the mighty Bald Eagle Grandfather, adorn these elegant bicolor gold wedding rings designed and handcrafted in Zhaawano's studio; the ladies' ring's feather design is mounted with a brilliant-cut white diamond. The feathers represent the spirit of the eagle, and therefore communication with, and love for, the Great Mystery of the Universe. 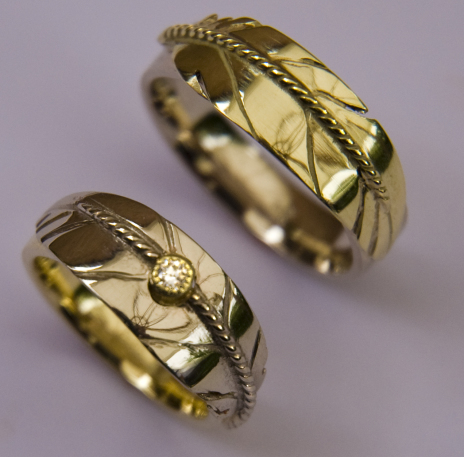 Migizi's feathers are believed to convey human thoughts and feelings; these wedding rings are a reminder to a married couple to speak and act with debwewin (a straight mind) and bekide'ewin (a pure heart). The feathers encourage the owners of the rings to allow their spirit to seek fulness and their heart to seek peace; the sparkling diamond of the ladies' ring represents Grandfather Migizi's gifts of love, vision, and courage.